via Guns and Tactics Tumblr. Yeah. 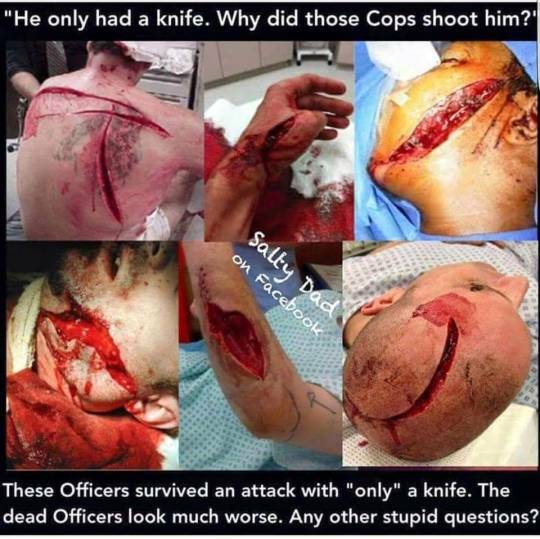 Knives are vicious and they're the tool of choice for many criminals now. Knives, clubs, bludgeons, quarters in socks, padded gloves, steel toe boots, etc... Improvised weapons used against you can be defended in court. You see a clown in gear with his "clan" then you put the dog down. Shoot first, defend yourself in court later. Oh and remember this. If you "see stars" or lose consciousness then you are at the mercy of your attacker. The moment they lay hands on you and you can't properly disengage and resume your attack is the moment you've given your life to someone that DOES NOT value it. Carry! Carry! Carry! Your sidearm is suppose to be comforting, not comfortable.